This is a perfect reborn doll designed by a famous artist.Cute and lifelike reborn doll. The doll will come with outfits and a magnetic pacifier.It will be a friend of your baby and the one of your family.Wish you love this. Size: 22 inch(57cm)newborn size weight:about 1. 5 kg. The doll will arrive with a magnetic pacifier and a feeding bottle to fit the mouth. Material: full body are of simulation silicone vinyl. The doll limbs can move, can sit and lie down can stand ,can't speak; can be put into water. Cloth:handmade. According to the doll size. Fits into newborn size(s 0-3 months) baby clothes. The doll will arrive with the clothes just as the photo shows. Hair:high quality mohair,manual implantation,can wash and dress up. Full body anatomically correct girl. 9. Feature: Joints of arms and legs are movable,The baby can sit, can lie, can entering the water, can't stand, can't speak, can't wink. 1. 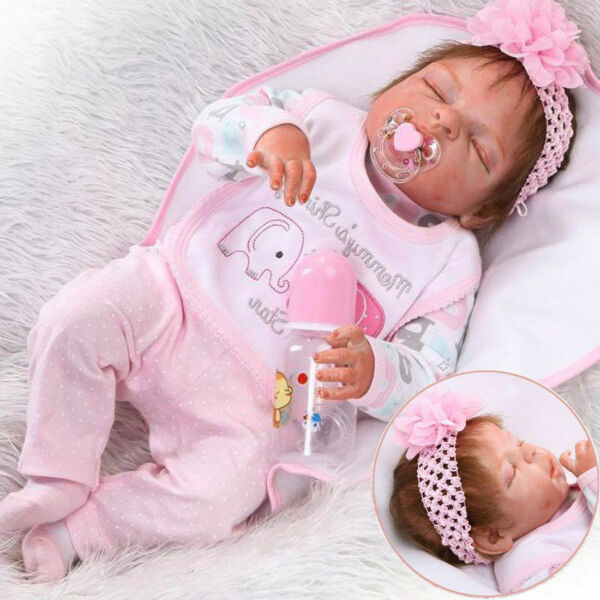 The doll is imitation and cannot be as soft as a real person, if you mind we don't recommend buying it. 2. If the product is urgently delivered, we do not recommend you to buy it, because the delivery will sometimes be uncontrollable.